Thousands of women - ordinary mothers, grandmothers, aunts and daughters, both Christian and Muslim - came together to pray for peace and then staged a silent protest outside of the Presidential Palace. Armed only with white T-shirts and the courage of their convictions, they demanded a resolution to the country's civil war. Their actions were a critical element in bringing about a agreement during the stalled peace talks. Pray the Devil Back to Hell require the purchase of a license through ro*co films educational. That's it! Once you receive the DVD, you can go ahead and pick date(s) and venue(s) and schedule your screening(s). Get to know the filmmakers and activists that brough you the award-winning film. 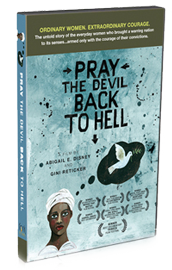 Since its festival premiere at the Tribeca Film Festival in April 2008 (where it won Best Documentary), Pray the Devil Back to Hell has screened in all 7 continents in over 60 countries in thousands of venues for women and men from all walks of life, in major cities as well as remote villages around the world. It has instilled hope and inspired many living in conflict zones and been called required viewing by dignitaries, politicians and leaders of peace keeping forces. The film is broadly credited with helping its lead figure Leymah Gbowee win the 2011 Nobel Peace Prize. *This was the combined ratings for the entire five part series of Women, War & Peace. Pray the Devil Back to Hell was one of those five parts. ** This includes 18 total awards for the film itself, and 17 awards for the filmmakers and activists of Pray the Devil Back to Hell. Is Pray the Devil Back to Hell available in other languages? For Home DVDs, the film is available with subtitles for an additional cost. Please contact us for more information if you would like to purchase a subtitled Home DVD. ITALIAN English audio with Italian subtitles FRENCH English audio with French subtitles SPANISH English audio with Spanish subtitles Contact us for details Please note that these versions all have English audio (English dialogue/spoken language) with subtitles on the screen. There are currently NO dubbed versions of Pray the Devil Back to Hell available for purchase. How may I host a screening of Pray the Devil Back to Hell in my own school or community? It’s easy! Please visit ro*co Films to order the Educational & Public Viewing DVD, which is specially licensed for public screenings and educational use. You can make your purchase by credit card, and the DVD will arrive to you in the mail. Feel free to pick any date and venue you like. How can I acquire rights to Pray the Devil Back to Hell for broadcast / online streaming / other forms of distribution? How can I license footage from Pray the Devil Back to Hell? Please note that much of the material used in this film was sourced from archival footage licensed from a third party, but we can provide a cue sheet, screener and contact information for the sources. Kindly review our Licensing Policy, which lists contact information and further instructions on how to license clips from Pray the Devil Back to Hell. How can I book one of the filmmakers for a screening or event? At this time the filmmakers have begun other projects and are not currently available to travel on behalf of Pray the Devil Back to Hell. However, if schedule allows, your invitation may be considered, so please feel free to contact Operations Manager Sarah Feuquay at sarah@forkfilms.net to inquire about filmmaker or speaker invitations. Please make sure to include in your inquiry: – What date(s) are you considering for a screening? – Is there an honorarium/speakers fee? If yes, what is it? – Who are you asking to speak, Abigail Disney or Gini Reticker? – Will you cover all travel expenses including transportation costs and lodging if necessary? If yes, is there someone from your organization/institution that can book the travel & lodging, or should expenses be submitted for reimbursement? – If neither Abby or Gini can attend, AND there is a speakers fee and travel costs covered, would you be interested in other speakers, such as any women from the film, crew members, or other people who can speak about Liberia, please contact us and we’d be happy to make suggestions. – Are you screening the film regardless of a speaker attending? How can I contact the filmmakers or one of the activists in the film directly? Please write to us with detailed information in regards to your inquiry and your request will be forwarded to the appropriate party. Please keep in mind that they may not be able to personally respond to each request. 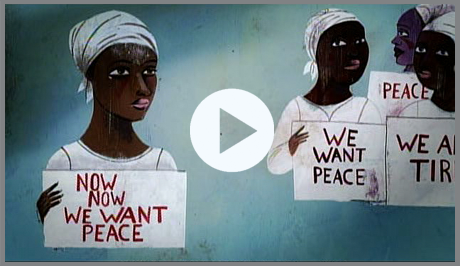 What can I do to help the women of Liberia and other peace activists around the world? Thank you for asking! Please visit Gbowee Peace Foundation Africa, an organization that envisions a peaceful, reconciled and empowered Africa that is responsible for investing in sustained individual and collective growth and development, or Peace is Loud, the foundation inspired by Pray the Devil Back to Hell. Peace is Loud’s mission is to generate a groundswell of people committed to building a culture of peace. How can I stay up-to-date on the film’s news advocacy, and outreach? Please feel free to join our mailing list here to receive our weekly newsletter and follow us on Facebook!